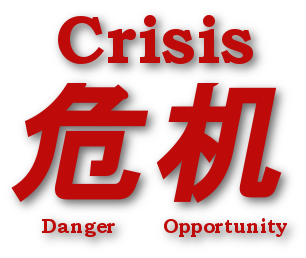 When written in Chinese, the word "Crisis" is comprised of two characters, one that represents "Danger" and one that represents "Opportunity". Combined they refer to dangerous opportunities. That explains a lot. Whenever I have encountered crises, I have always experienced a sense of dread for a pending danger. The challenge is how to react to that perception of danger. ... or, do you look for the opportunity? I would encourage you to look for the opportunity. Be respectful of the dangers, for sure. But don't forget to look for the opportunities.